that had languished abandoned for decades. while paying meticulous attention to detail. The Festival Tra Luce & Sogno will be held in Castello di Postignano, close to charming historical villages and a wealth of Art treasures, surrounded by the green and pristine scenery of Valnerina. During your stay at Postignano, you'll have the unique opportunity to experience the pace and atmosphere of bygone times; you will be discovering the hamlet while strolling along its alleys or exploring the surrounding nature; you will relax in the castle's library, sip a cup of tea in its living room or taste some good vintage in its wine shop. 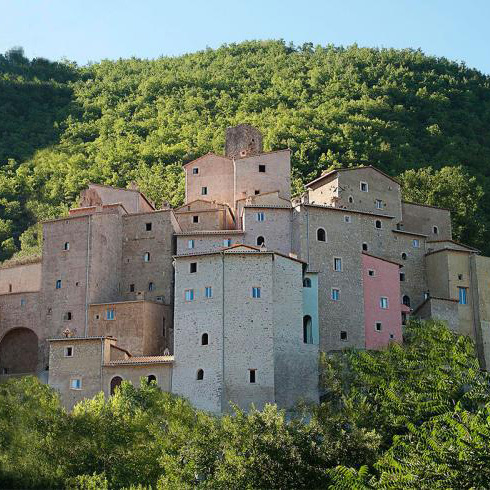 Meals throughout the Festival will be catered by La Casa Rosa, the real heart of the Postignano castle. Its cuisine is simple, and its philosophy is based on great care, respect for local traditions and excellent quality of the fresh ingredients. The suites are unique and individual, with views on the surrounding hills; they are welcoming and elegantly furnished, including antiques and traditional Umbrian textiles. The suites are on one or two levels, with exposed wood beams and either parquet or terracotta tiles floors. All have a comfortable living room, while different units have one, two or three bedrooms and one or two bathrooms. The Castello regularly hosts music-related events and activities within its walls. Visit the Castello di Postignano's website for upcoming events.